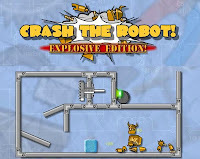 Crash The Robot 2 Explosive Edition is a new physics based point and click puzzle game from tamasgames. This version is basically the new level pack to the original Crash the Robot physics puzzler. There are new features and a lot of brand new ways to destroy the robot. Your general objective is to destroy the standing robot by using bombs and other objects to bring different mechanisms to operation in correct sequence to destroy the robot. There are 40 levels and 5 bonus levels each with unique challenging puzzle. While the graphics and animation of this game is really great, you may find some certain levels to be a bit difficult though not impossible to beat. Here is Crash The Robot 2 walkthrough with the solution.